You've heard this common theme repeated by your parents, your teachers, your managers ... even your significant others: It's up to you to take ahold of the opportunities presented and make something of them. The problem is that opportunities usually equal choosing the hard thing. It's much easier to stay constant on the current path, walking with the wind rather than against it. But as Winston Churchill said, "A pessimist sees the difficulty in every opportunity; an optimist sees the opportunity in every difficulty." And when it comes to your business, there are a lot of difficulties that equal big opportunities. However, when you're in the middle of it, it's not easy to recognize or focus on what actually matters -- it's that whole "can't see the forest for the trees" conundrum. We pulled a few stats from our Agency Pricing & Financials Report that detail how agencies price their services, manage their firms, sell, and service their clients to highlight a few issues that, if improved, could equal significant opportunities for agencies as they work toward growth, stability, or higher profitability. Download the full report here or view a few of the interesting charts below. 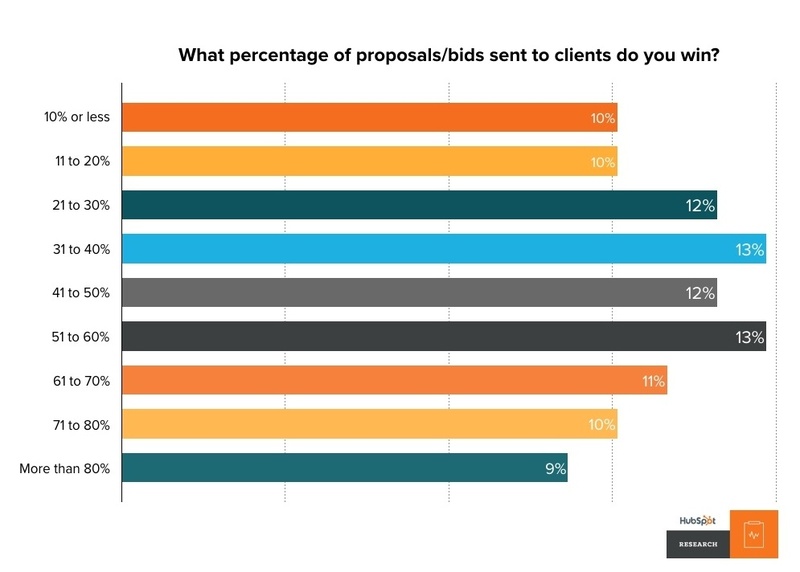 1) 57% of agencies win less than 50% of proposals sent. 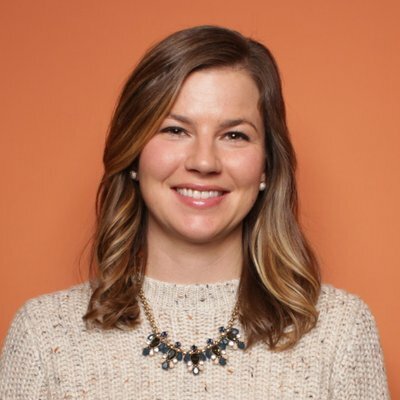 Depending on how in-depth your agency's proposals are -- the length, the amount of research you do, how much you give away (i.e., the strategy), and design -- creating a proposal can be a time-consuming and arduous process. It might take you two hours, eight hour, or upwards of 40, depending on the requests of the prospect. And all of that time is arguably wasted if you don't win. That's why it's so concerning to see that a majority of agencies don't win even half of the proposals they create. Increasing the conversion rates of your proposals by improving your sales process should be a priority. And this all starts with understanding what types of clients actually want to buy your services -- what makes a prospect a good fit. By having the right qualifying questions, you can increase the time you spend with prospects who would benefit and see the value of your services and spend less time writing proposals that are ignored or irrelevant. 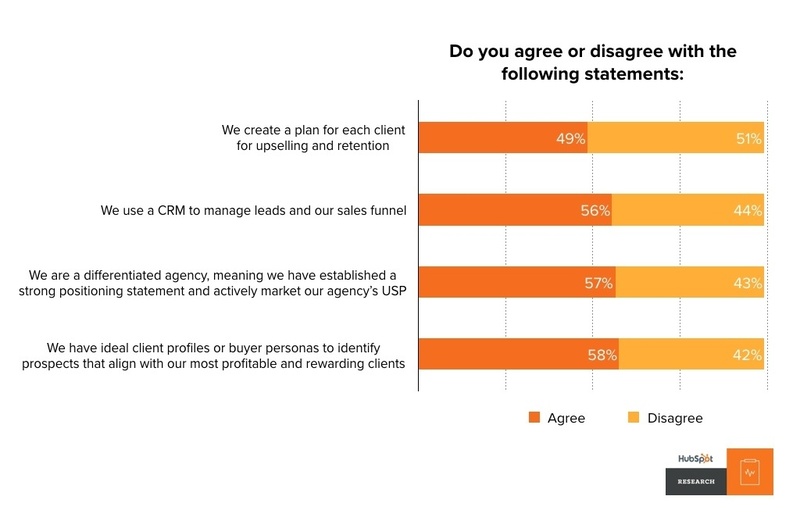 2) 44% of agencies don't use a CRM, and 42% haven't defined their ideal client. That many agencies don't use a CRM and have yet to identify which clients are a good fit for their agency and services further supports the low conversion rate on proposals. In the survey, we also asked how satisfied respondents were with their sales process: Only 28% were satisfied or very satisfied, while 41% were not satisfied or very dissatisfied. Even more confusing is the 31% who responded as "neutral," signaling a lack of concern or worry about growth. I'm not saying that every agency needs to be highly focused on gaining more and more and more new clients. In fact, the opposite is often recommended. You can grow by building a roster of 10 or 20 highly profitable client accounts that provides your team with the opportunity to do highly rewarding work. But without a sales process -- and an understanding of who these future profitable clients are, how they think about marketing, what they value, etc. -- then you're simply chasing one account after another. And without a tool or system for tracking prospects, you could be losing out on valuable business you've already invested hundreds of hours in. If you're marketing your agency right, the clients you really want should already know about you. And even if they're not ready to switch shops today, they should think of you when they do begin to look around. A CRM can help you to stay in touch with these people -- something that old Excel file can't yet handle. 3) Agencies fail to track future-looking metrics. Without tracking the right financial metrics, agencies can't truly understand the health of their business. And while it's necessary to track revenue and profit numbers, these only tell the story of how well the company is doing today, not tomorrow or next week or three months from now. 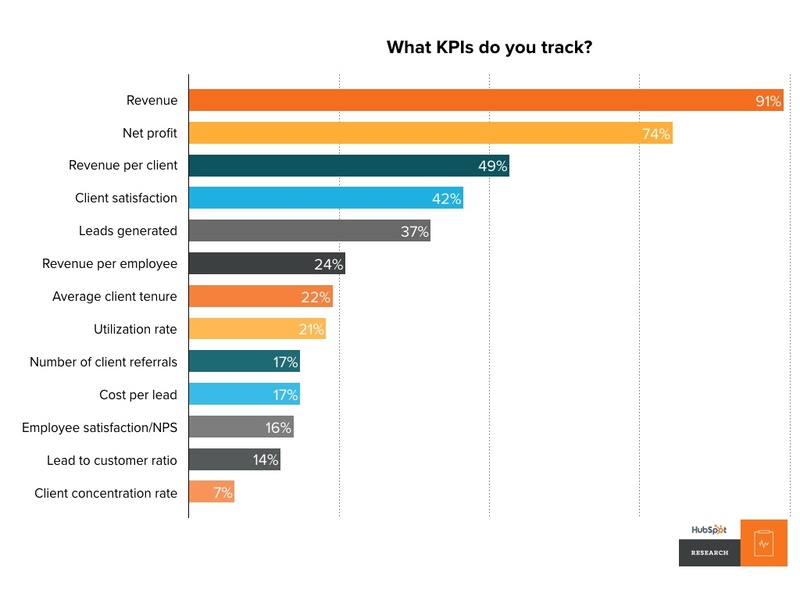 Metrics such as leads generated and client satisfaction provide more forward-looking information. By tracking average client tenure, you can spot clients at-risk of leaving before you get that dreaded phone call or request for an urgent in-person meeting. It also doesn't reveal the opportunities for greater efficiencies. Do you know how much your agency is losing due to overservicing? Do you understand which client accounts are profitable? And which ones are costing you money? If the utilization rate for your agency is too low, then maybe your firm has become top heavy, with too many non-billable employees in management. If you're employee satisfaction score is low and turnover is high, what's causing this? As I hope the above shows, these metrics are only the starting points for more in-depth conversation and analysis, but they will help guide you to new information and possibly a solution. Otherwise, you're simply running in the dark toward revenue and profit numbers. 4) Agencies are too reliant on referrals and word of mouth. 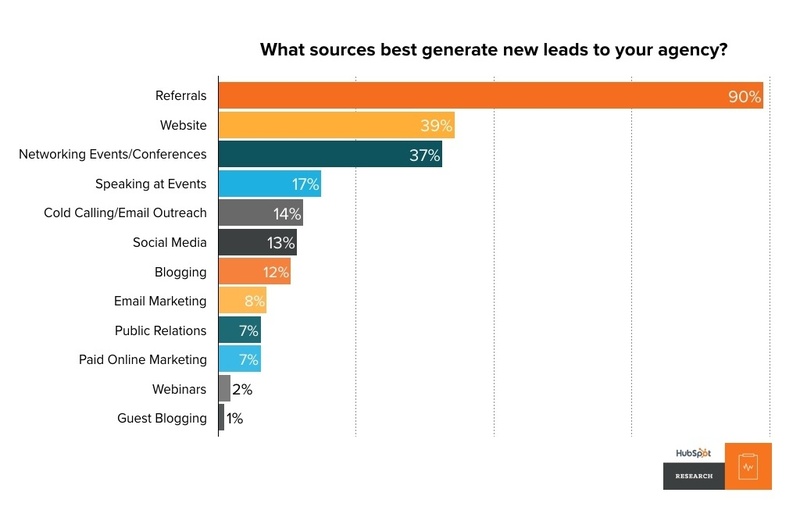 It's no surprise that referrals are listed as the best source of new leads for agency new business. And referrals are valuable -- we know that referrals convert at a higher rate and have a higher lifetime value. 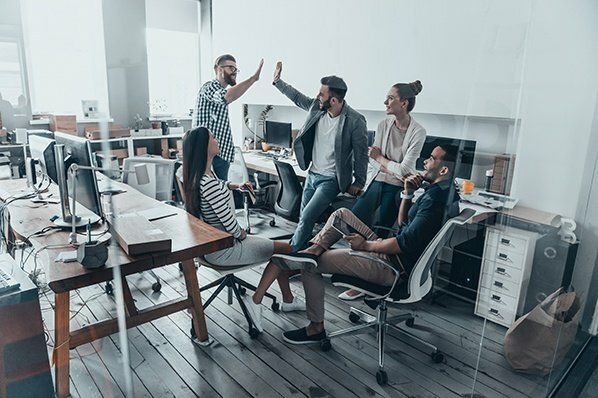 However, by relying on referrals too heavily, agencies are essentially putting their new business development in the hands of their clients -- some who are happy and some who are not. And referrals don't scale as well as many other methods, such as focusing on lead generation through blogging, social media, PR, and events. In addition, referrals are influenced by things such as public speaking, publishing educational content, the professionalism of your web presence, etc., so it's important to create a sustainable plan for marketing your agency and driving both referrals and new connections with clients outside your current sphere of influence. What are the biggest opportunities for improvement in your agency? Let us know in the comments below!